I am particularly fond of Dakota Ridge Subdivision and Bonnie and I own two homes there. 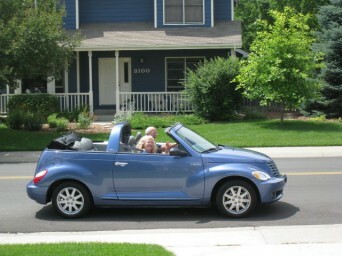 The picture to the right is of my wife and I tooling around the neighborhood. We first bought a home there in 2009 and bought our second one last year. Each home was in excellent shape and a great buy. Both homes, despite the economy, have increase significantly in value and we bought them in the low $300s. We paid $85 per square foot for the first one and $80 per square foot for the one last year. Currently two homes were sold in the last few days at about $95 and $98 per square foot. The only other property for sale in Dakota Ridge is currently priced at $105 per square foot. I know of no other subdivision in the area that has seen this kind of appreciation in the last few years. The last home we purchased was on the market 1 day and it had 3 offers on it. Why Do Buyers Fall in Love with the Dakota Ridge Subdivision? Dakota Ridge is immediately appealing when you drive into it because it is an immaculately kept community with mature landscaping. It sits near a major grocery store that you can walk to and one of the newest and largest shopping center is only a 5 minutes drive. Fort Collins High School, one of Poudre School District's premier schools, is located on the western edge of the subdivision and a 5 minute walk for most resident children. Furthermore, you are 10 minutes from I-25 and only about an hour from Denver International Airport and/or the cultural and sports centers of the Denver Metropolitan area. Currently, the only home available in Dakota Ridge is an amazing residence that has more energy efficient features than most new built home being constructed today. This 4 bedroom home has a wonderful open feel in the kitchen, dining and living room with a really nice fireplace that is visible from these areas. The back yard has a wonderful patio for entertaining guests, and if you have kids, a great play set is present too. I would love to show you this home. If it sells before you can look at it, I can watch this neighborhood, which is my neighborhood, and let you know the minute anything comes on the market here that might fit your needs. Come join us in this beautiful child friendly, bike friendly, and dog friendly safe and comfortable community. Please give John a call at 970-412-1657 for extensive information about buying or selling homes, town homes and condos in cities such as Fort Collins, Loveland, Berthoud, Wellington, Timnath, Windsor, Severance or nearby urban or rural Northern Colorado areas.